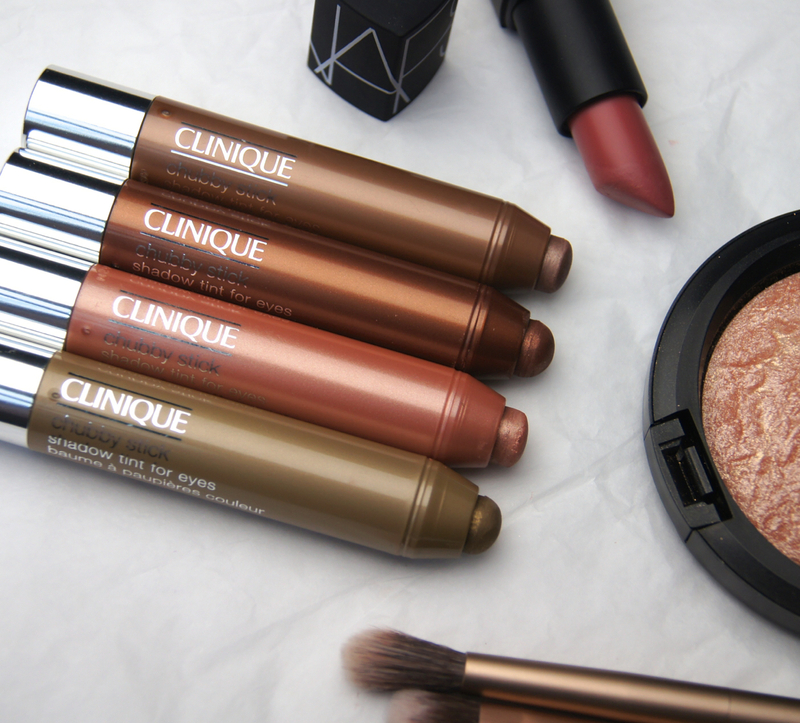 Clinique have got the whole, easy-peasy, amateur-friendly makeup range down, don't they? Setting the trends with their Chubby Stick line, they've certainly helped me to cut minutes off my makeup routine in recent years. I love their original lip balms and their more recently released blush, contour and highlight sticks. Today though, I want to focus on the cream eyeshadows. 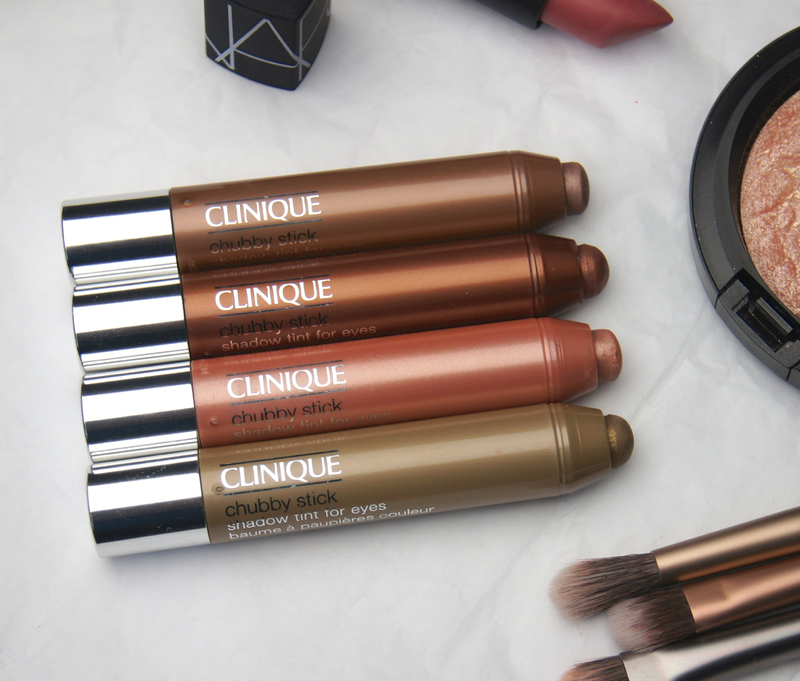 The Clinique Chubby Stick Shadow Tints For Eyes are what I've been wearing non-stop, recently, rotating between the four shades that now seem to be a permanent fixture in my makeup bag. Whether an eyeshadow expert or utter novice, everyone loves a product that requires little patience or effort to create amazing results. That's where cream formulas shine. Although they may seem difficult to master for anyone that is new to makeup or sticks with powder eyeshadows, most are actually easier to work with. Looking for a super speedy, foolproof eyeshadow to create a professional look without any hard work? The Clinique Chubby Sticks For Eyes are a winner. To use as a base to create a dramatic, smokey eye or to wear alone for a fuss-free sweep of colour, these crayons are a dream to apply. Compared to similar shadows I've sampled, such as the Laura Mercier Caviar Sticks or Bourjois Colorbands, the Clinique Shadow Tints have a firmer texture. Yes, they feel smooth and creamy as they glide onto the eyelid, but the finish is light and not at all wet or tacky. When applied directly on to the eyes, they don't drag or tug the delicate skin, but it's always best to warm the crayon on the back of the hand a little, if they haven't been used for a while. As the sticks aren't too soft to begin with and dry to more of a powder finish, blending the colour quickly is essential. Using a brush to soften the edges of the colour is fine, but a finger works best, as the natural warmth gives the shadow more slip and extends the play-time. After a minute, the shadow sets solidly in place and won't smudge or crease for an impressive eight hours of wear, at least. Wearing a primer underneath isn't necessary either, except for those who have to contend with particularly oily eyelids. Out of the fourteen shades on offer, I have four. 04 Ample Amber is a peachy gold shade saturated with silver shimmers. Perfect for the summer months, it's a bright shade that really brings the eyes to life. 02 Lots O' Latte is a soft brown taupe containing tiny flecks of silver shimmer. Easy to wear, this is such a staple neutral colour that pairs well with everything. When making the lips a statement feature with a bold lipstick, Lots O' Latte is a great choice as it adds depth, without being distracting. 03 Fuller Fudge is a deep warm bronze full of golden shimmers. 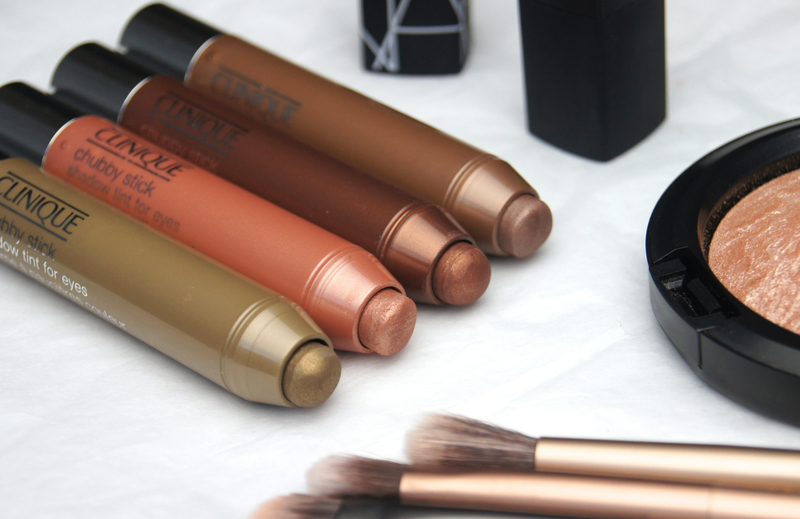 Because who isn't a fan of a metallic coppery-bronze eyeshadow?! 05 Whopping Willow is a muted olive/khaki shade full of golden shimmer. An alternative to standard brown tones, it adds a pop of colour, whilst still being subtle and surprisingly natural-looking. Clinique describes the Shadow Tints as a providing a sheer wash of colour, but I wouldn't necessarily agree. Soft is a better way of describing them, as even the darker shades never look severe. 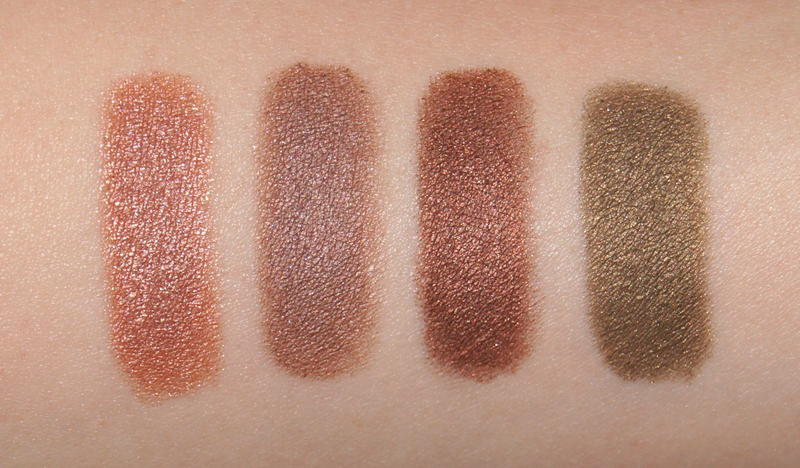 All four of the shades in my modest collection are well pigmented and more or less opaque, even in one swipe. The more the colours are blended though, the lighter and sheerer they become, so keep blending to a minimum and only buff the edges to maintain a stronger colour. Building intensity by layering the product also works well, without a thick, heavy excess weighing the eyelids down after a few coats. The Chubby Stick packaging couldn't be more perfect, really. Ideal for traveling with, the twist-up crayons are slim and don't need to be sharpened. Having a rounded nib, the crayon fits into the eye socket really easily and, as it's quite a fat stick, the colour can be applied in just a couple of strokes. With continued use, the domed tip does start to flatten, but it can always follow the contours of the eye with ease to deliver a precise application. One stick of mine has become slightly loose in the tube, but it hasn't fallen out and will survive as long as I don't wind up the pencil too far. As with any, cream product, it's crucial to reapply the lid tightly after each use, in order to prevent the shadow from drying out. At £17 each, these eyeshadows sticks are neither cheap, nor expensive. It may be possible to find bargain dupes in the drugstore, but Clinique's range includes a whole host of exciting shades in the line that are difficult to find from budget brands. Considering just how well the Chubby Stick Shadow Tints wear for up to twelve hours, they're just a cut above those that you'll find in Boots and totally deserve the price-tag they have, in my opinion. What are your favourite, cream eyeshadows? Are you a fan of the Chubby Sticks For Eyes? Gah these shades are incredible!! These look so incredible! I love all kinds of chubby stick products, from lips to eyes, and these look like the next additions to my collection! Great reviews! I love your swatches! At first I was a little worried that these would be too fat to apply nicely on the eyelids but I think they would work well at covering over the eyelid quickly like you said. I haven't tried any of the other eyeshadow sticks that you mentioned but these look lovely! I particularly love the look of Lots O' Latte and Whopping Willow!!! Gorgeous. OMG these shades are divine. Wish list!! i really love eyeshadow sticks for lazy days when i don't want to go all crazy on my eyes and the colors look amazing but the actual head of the stick looks quite big to me. i think i still have to have a look at them. Great post,loved it!Your post was very interesting and amazing,loved the photos. Holy! the pigmentation is awesome!